"We might in that quadjumper!" 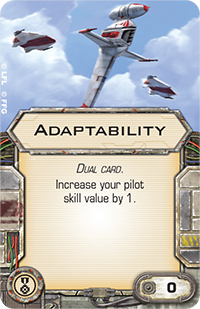 We begin our preview of the Quadjumper Expansion Pack for X-Wing™ with a caveat—when Finn and Rey discussed the possibility of stealing a quadjumper to outrun a number of First Order TIE/fo fighters, it was within a specific context, one in which the idea was presented as an alternative to running across the sands of Niima Outpost on foot. 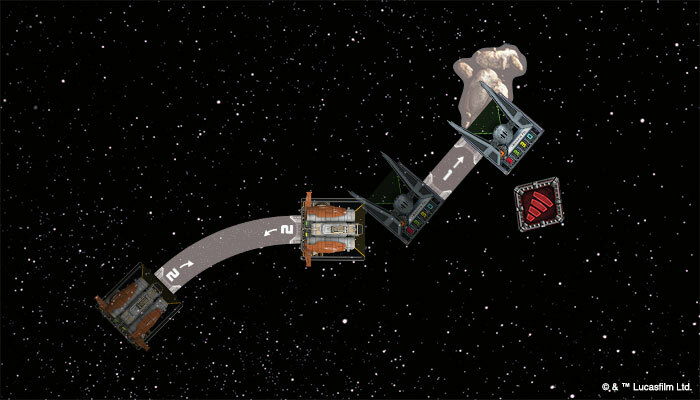 No, the quadjumper is not going to outrun a TIE/fo fighter in any fair sort of race. It won't even outrun a TIE/fo fighter in a race that's only just a little bit unfair. The TIE/fo fighter is a fast and agile performance starfighter. The quadjumper is a spacetug. The TIE/fo fighter was built for streaking across battlefields, even as it turned, weaved, and rolled to avoid enemy fire. The quadjumper was built to maneuver containers quickly through orbital transfer yards. That said, the quadjumper is very good at what it does. It is powerful and maneuverable, and modified quadjumpers are often put to use as smuggling ships or exploration craft. 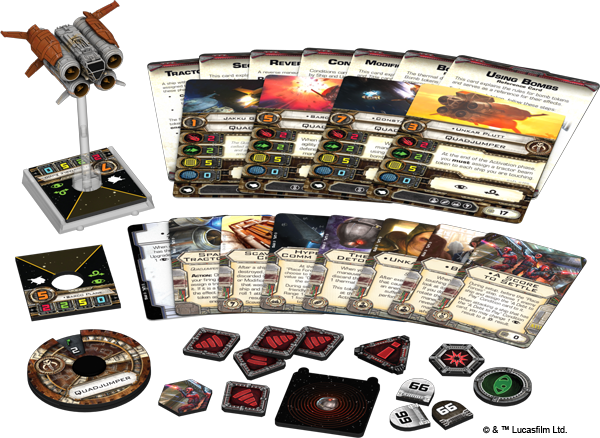 At times, the typically unarmed ship is even outfitted for battle, and this is the case with the quadjumper that you will find in the Quadjumper Expansion Pack for X-Wing. A 360-degree view of the quadjumper. 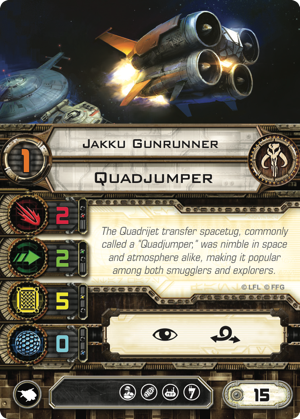 The quadjumper comes with a primary weapon value of two, an agility value of two, a hull value of five, and no shields. At a base cost of fifteen squad points, these statistics make the quadjumper look a little like a cheaper, less durable TIE bomber, especially since the quadjumper can, in fact, equip a bomb. 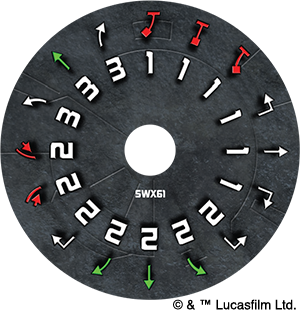 However, these statistics don't really suggest the quadjumper's role within the game; more than anything, the quadjumper's identity stems from its maneuver dial and the unique "reverse" maneuvers it allows you to execute. Just as it sounds, the quadjumper's reverse maneuver allows you to move it backward. Instead of slotting the maneuver template into the front guides and moving the ship forward until you line up the opposite end of the template with its rear guides, when you execute a reverse maneuver, you slot the maneuver template into the quadjumper's rear guides and move the ship backward until the distant end of the template lines up with the ship's front guides. Along with its barrel roll, then, and its three forward speed "1" maneuvers, the quadjumper's three speed "1" reverse maneuvers make it a uniquely maneuverable ship in close quarters. 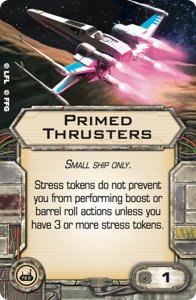 Add to this the facts that its lowest pilot skill value is "1" on the Jakku Gunrunner and that it features a crew slot, and you have the potential for a new Scum and Villainy "blocker"—a ship that can move to interrupt your opponent's flight paths in the manner described by three-time World Champion Paul Heaver in his article, "Block Party." 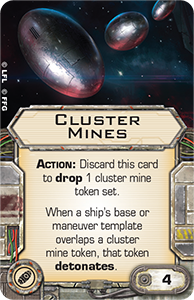 Even though these are not the only sort of tactics you can pursue with your quadjumper, they gain additional strength from the quadjumper's ability to equip tech and illicit upgrades, as well as from the Quadjumper only modification, Spacetug Tractor Array . 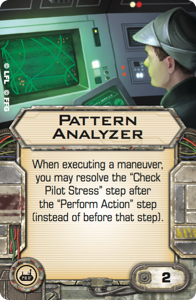 The tech upgrade slot allows you to outfit your quadjumper with the Primed Thrusters or Pattern Analyzer that you'll find in the Heroes of the Resistance Expansion Pack, either of which could allow you to barrel roll into blocking position even after executing a red maneuver. 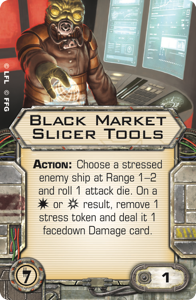 Meanwhile, if moving to block a ship leaves you without a shot, the ship's illicit slot might still allow it to deal damage through either a Feedback Array or Black Market Slicer Tools . 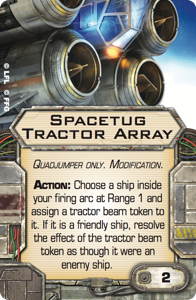 Finally, the Spacetug Tractor Array extends your quadjumper's ability to block enemy ships even further. As an action, the Spacetug Tractor Array allows you to assign a tractor beam token to a ship that's both at Range "1" and inside your firing arc. 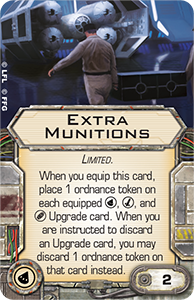 With this tractor beam token, you might be able to boost or barrel roll your enemy's ship so that it can't help but collide with an asteroid or another ship. 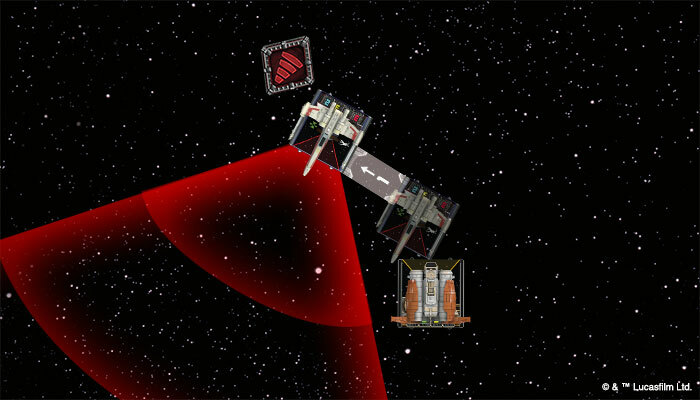 Alternatively, because your quadjumper's Spacetug Tractor Array allows you to resolve the effect of your tractor beam token on friendly ships, you might boost or barrel roll them at a pilot skill value of "1," moving them into position to block your enemy's movement, and allowing them to execute their maneuvers and line up their shots at a higher pilot skill, after your opponent's ships have finished moving. A Jakku Gunrunner with Intelligence Agent , Primed Thrusters, and Spacetug Tractor Array—is this the new Scum "blocker"? 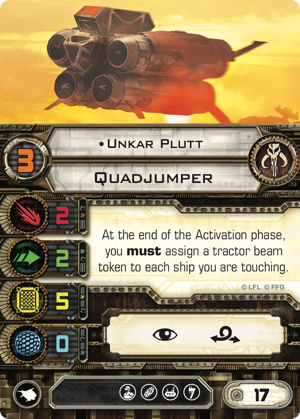 Of course, for all that a Jakku Gunrunner can do with a quadjumper, it is just one of the four ship cards from the Quadjumper Expansion Pack. The other three are all higher pilot skill and unique, and among them we get both a crook and a constable. It's no great surprise that we find a crook arriving to the game in a Scum and Villainy expansion, nor is it really a surprise that this crook offers your squad the use of some "dirty" tactics. Known as "The Blobfish" among Jakku's scavengers, Unkar Plutt is a massive Crolute and the desert planet's junkboss. From his appearance in The Force Awakens, we know that Unkar Plutt is a thief with a number of thugs at his command. In X-Wing, he appears as both a pilot and a crew upgrade. 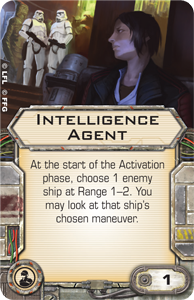 "At the end of the Activation phase, you must assign a tractor beam token to each ship you are touching." With some clever flying, Unkar Plutt's special ability might allow you to block a ship before forcing it to barrel roll into position for the Crolute to take a shot, even while your opponent's ship would not. Or you might just send your enemy into the firing arc of a friendly ship that has A Score to Settle with that enemy. 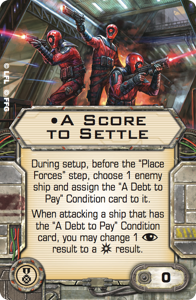 When that enemy is marked by the A Debt to Pay condition, Unkar Plutt's ally can convert one of its results to a result. 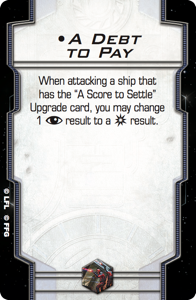 The enemy, likewise, can convert a into a against the ship equipped with A Score to Settle, but by blocking the ship in the first place, Unkar Plutt can deny it an action, and then when he assigns it a tractor beam token, he may be able to force it out of position to claim its retaliatory shot. As for the crew version of Unkar Plutt , he allows you to perform an action even after your ship overlaps another, but he forces you to suffer a damage in order to do so. This makes him an excellent candidate as crew member for any low pilot skill value quadjumper equipped with a Spacetug Tractor Array or Black Market Slicer Tools , as the upgrades would allow him to either force an enemy's ship to reposition before it executes its maneuver—potentially causing it to careen into an asteroid or debris field—or to damage any stressed enemy ship before it can execute a green maneuver to clear its stress. 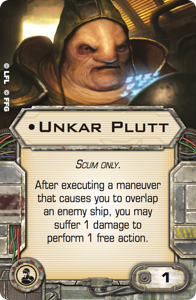 Simply reveal a maneuver that slams your quadjumper into your opponent's ship, and Unkar Plutt lets you take the action you need. "When you reveal a reverse maneuver, you may drop a bomb using your front guides (including a bomb with the 'Action:' header)." 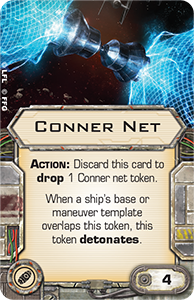 Not only is the Constable clever in the way that encourages the use of Action bombs like the Conner Net and Cluster Mines , he's also resourceful. 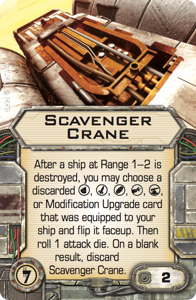 Even though the quadjumper features just a single bomb slot and doesn't come with the torpedo slot that would allow Constable Zuvio to equip the Extra Munitions upgrade, the Kyuzo can potentially rearm his bombs after each use by scavenging the wreckage of other ships with the Scavenger Crane upgrade. 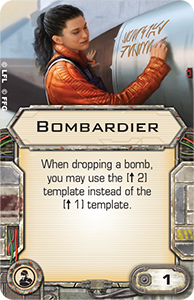 Also making its debut in the Quadjumper Expansion Pack, this illicit upgrade affords you a chance at refreshing just about any secondary weapon whenever another ship is destroyed at Range "1–2." 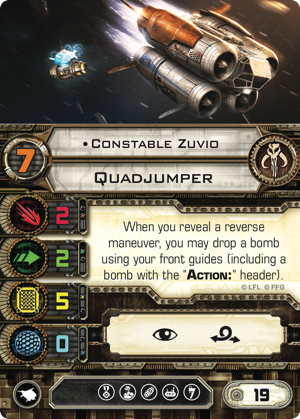 Equipped with Cluster Mines, Adaptability , Scavenger Crane, and a Bombardier , Constable Zuvio is an unpredictable pilot, able to deal tremendous amounts of damage by triggering bomb after bomb. The quadjumper isn't typically a combat ship. In fact, it's rarely armed. But don't let that fool you into overlooking all the devious new tricks that the quadjumper and Quadjumper Expansion Pack can bring to your Scum and Villainy squadrons. Like any ship, the quadjumper can be modified and upgraded for combat. 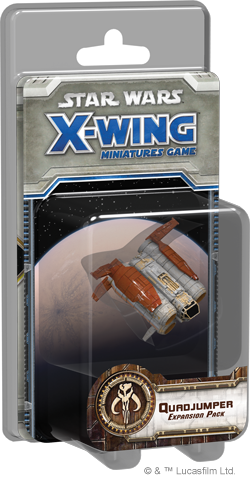 That is the case, after all, with the combat-ready quadjumper coming to X-Wing. 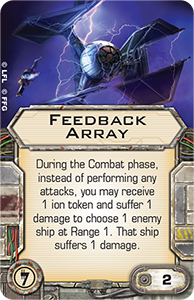 Still, modifications and upgrades are more or less superficial adjustments to the core ship, and in X-Wing, the core of a ship is determined by its maneuver dial. It is here that the quadjumper stands apart and earns its own role within your fleet. What can you do with a ship that features six speed "1" maneuvers? What will you do with a ship that can drop bombs after flying in reverse? Share your thoughts on how you might use this sturdy and maneuverable vessel with the other members of our community forums. Then be sure to head to your favorite local retailer to pre-order your copy today!